Over the years I've had a number of enquiries concerning the installation, commissioning and signing off of antique solid fuel burning appliances. Many installers decline to have anything to do with appliances that predate the current regulations, I feel this is a misreading of the regulations and I have endeavoured to try to collect together the snippets of information that I have encountered. The appliance must have a net efficiency of at least 65%. Multiply by 0.9 to convert net to gross. Manufacturers typically quoted gross efficiency up until the 21st Century. The appropriate fuels for the appliance should be determined and noted. Many antique appliances due to being of cast iron construction can frequently burn coal, smokeless, wood and even petroleum coke. It should be determined if the appliance is an 'open' or a 'closed' appliance and a suitable hearth fitted. 300mm minimum for an 'open' appliance a 225mm minimum for a 'closed'. A freestanding appliance should be on a superimposed hearth 840mm2, with the clearances given above dependant upon open/closed determination. It is unusual to be able to determine whether or not the appliance has been tested to raise the temperature of the hearth to less than 100°C. I take the view that if the appliance is raised sufficiently, with a log store for example, this is a reasonable supposition and the appropriate hearth: that is a 12mm superimposed hearth is legitimate. The make and model of the appliance should be determined. It should be determined if the appliance is suitable for 'continuous' or 'intermittent' use. Most modern appliances are 'intermittent'. The appliance should be airtight sealed to the room. Any mica windows should be intact or re-glazed with new mica or fire glass. Fire rope seals should be serviceable or made to be so. If any manufacturers installation instructions are available the should be followed unless they are in conflict with Document 'J'. If they exceed Document 'J' they should be followed. I take the view that the CE legislation that came into force in the UK in summer 2013 makes not a jot of difference to antiques as they are not sold 'as new' and regulations do not require retrospective application. Many antique burners have smaller than standard or unusually sized outlets. It is good practice to size these to modern standards and connect them to 5" or 6" pipes/flexible liners. It is a not legitimate to decrease the size further. inclusive of registration plate, CO Alarm, HETAS certification and Dataplate. 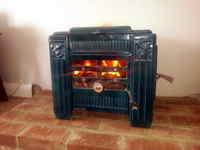 No antique appliance can legitimately burn wood in a smoke control area (SCA). However burning smokeless fuels would be legitimate use. As councils usually police SCAs by observing 'thick smoke' from residential premises, if the burner can be induced to burn hot enough it is unlikely there would be cause for prosecution. The CO output at 13% oxygen is beyond mine and most installers capabilities of being determined. The retailer of the stove will often know much of the information needed and even if all they know is the name of the manufacturer this can often be sufficient to determine much of the other information required. 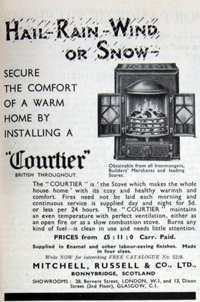 A stove I encountered recently made probably immediately post war and know to be called a 'Courtier' I managed to track down all the required information from industrial heritage websites once the manufacturer was found. In this case Mitchell Russell & Co of Bonny bridge, Scotland. 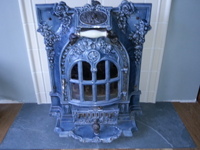 Based in Marlborough, Wiltshire, specialising in antique French stoves, Deville, Chappee, Godin, Pied Selle etc.